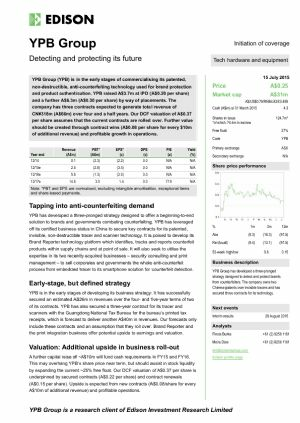 YPB Group Limited (ASX:YPB) is pleased to announce that it has received a purchase order for the amount of $150,000 USD (circa $208,000 AUD) as a licence fee for an order of its proprietary VariSec Foil technology which will be applied to 11 million units of one of the world&apos;s most issued passports. 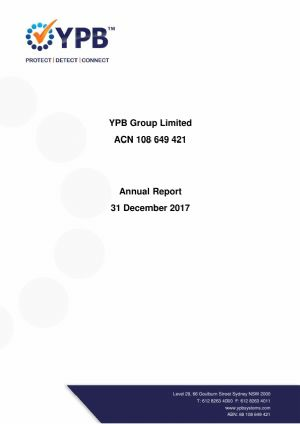 YPB Group Ltd (ASX:YPB) is pleased to advise that, further to the passing of Resolution 7 atthe Extraordinary General Meeting held 30 October 2018, the convertible notes summing to an aggregate face value of $1.5m, have been settled and the associated funds net of costs have been receipted by the Company. 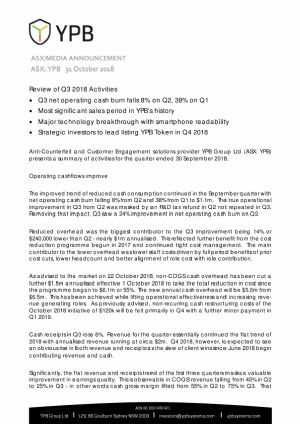 Anti-Counterfeit and Customer Engagement solutions provider YPB Group Ltd (ASX:YPB) presents a summary of activities for the quarter ended 30 September 2018. 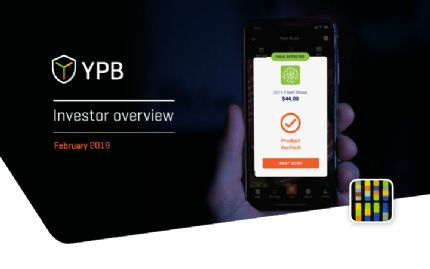 YPB Group Ltd (ASX:YPB) provides the Company&apos;s latest Investor Presentation at Techknow Invest Roadshow. 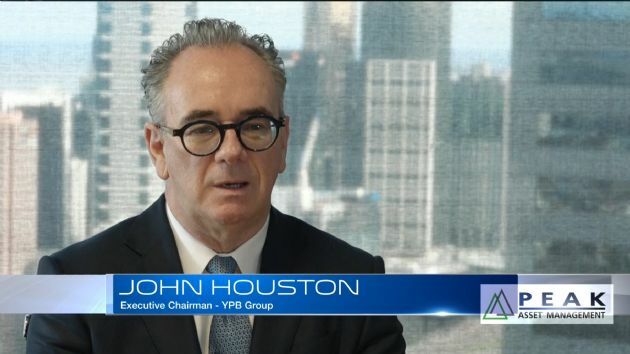 Anti-Counterfeit and Customer Engagement solutions provider YPB Group Ltd (ASX:YPB) has taken a further step in the operational restructure commenced in July 2017 when Executive Chair John Houston resumed the operational helm as CEO. 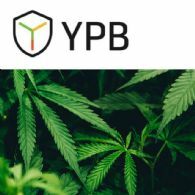 Anti-counterfeit and customer engagement solutions provider YPB Group Ltd (ASX:YPB) is pleased to announce a three year exclusive supply agreement with Shatterizer Inc., the fourth client under the "Cannabis Confirmed" initiative with leading Canadian cannabis e-commerce hub, Namaste Technologies Inc.(CVE:N)(OTCMKTS:NXTTF)(FRA:M5BQ). 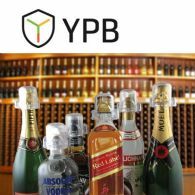 Anti-Counterfeit and Customer Engagement solutions provider YPB Group Ltd (ASX:YPB) has signed a three year plus two year option Master Supply Agreement to provide Accolade Wines with YPB&apos;s integrated brand protection and customer engagement technology suite. 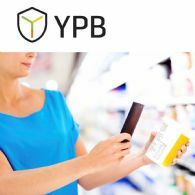 Anti-counterfeit and customer engagement solutions provider YPB Group Ltd (ASX:YPB) has secured a significant new distribution partner in China, the China arm of a privately owned multinational plastics supplier, which opens access to FMCG producers in China for YPB for the first time. The term of the contract is 3 years. 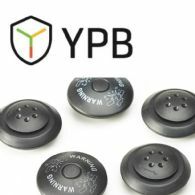 Brand Protection and Customer Engagement solutions provider YPB Group Ltd (ASX:YPB) has secured its first customer for Concept Tag, an anti-theft tag that dramatically reduces in-store theft rates. 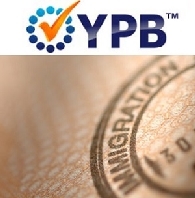 YPB has partnered with the Australian distributor and has a number of trials in train with major Australian retailers.